Having difficulties looking for needle valves? We can help you because we have all sizes. Needle valves are used for fluid flow control applications. They are also called pressure control valve or pressure reducing valve and are made of steel and stainless steel. Needle valves are able to withstand until 10,000 PSI working pressure, depending on the working temperature. The two common connections for needle valves are NPT and BSPP. Needle valves are used for fluid flow regulation. The needle-shaped plunger inside ensures precise flow. The plunger will retract as the handle is turned on, which will give way for the fluids to start flowing between the seat and the plunger. A few turns must be made to the handle, to retract the plunger, to ensure precise flow regulation. Needle valves are used in industries requiring control or metering of fluids such as oil, water, and gas. However, needles valve are not suitable for normal shutoff applications. Commonly used materials for needle valves are Steel and Stainless Steel SS316. 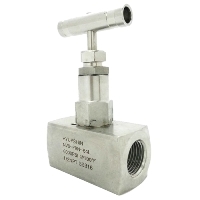 Stainless steel needle valves are used for corrosive handling, sampling systems and chemical processing applications, to name a few. 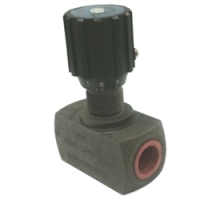 While, steel material needle valves are commonly used in oil and gas, refineries, chemical, and water and wastewater industries. Needle valve sizes range from 1/8" to 1" and are available in 350 Bars, 6000 PSI, and 10,000 PSI. It is good to note that the working pressure may vary depending on the temperature, as higher temperature results to reduced working pressure. 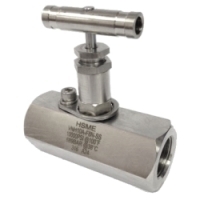 There are 2 available connections for needle valves namely NPT (National Pipe Thread) and BSPP (British Standard Pipe Parallel), and it comes in two variations, which is the Bar Stock Needle Valve design and Bonnet Needle Valve design. ​​For more information, please refer to en.wikipedia.org/wiki/Needle_valve. Needle Valves can be found in the IMPA Marine Stores Guide, which is the world’s leading reference guide for maritime purchasing and supply.